Randall Aiken: "You shouldn't fear me. I'm just one man. The "glorified bus driver's" backup." Jameson Locke: "One man that was a Spartan." Colonel Randall Aiken, formerly Randall-037, was a commissioned officer of the Colonial Guard on the Outer Colony planet of Sedra and a former Spartan-II supersoldier. "See, I already died. That's the difference between you and me. Gave my life away when I was signed up to be a soldier." Born in Hull, England on Earth in 2511, Randall Aiken was abducted by the Office of Naval Intelligence for the classified SPARTAN-II program at the age of six in 2517. Randall was brought to Reach and trained by drill instructors and Chief Petty Officer Franklin Mendez and the AI Déjà. Around 2527 Randall caught a fellow Spartan, Soren-066, and an Insurrectionist named Partch breaking into a lab within the Reach FLEETCOM Military Complex. Being suspicious of their activities, he escorted them outside to verify why they were there. Soren attacked Randall as they were leaving, and, after a brief struggle, Partch shot him with a tranquilizer dart, knocking him out and allowing them to escape. Afterward, Mendez reported to Dr. Catherine Halsey that Randall was doing fine but was angered with himself for letting his guard down. Mendez said that he had not let it down much, that he had done what he could, and it was good for him to go through something like that because it would make him a better soldier in the long run. Randall and his daughter watching the sunset in Sedra City. During the Human-Covenant War, Randall-037 participated in fifty-nine battles and military operations. His last official service as a SPARTAN-II was in 2532 in the Battle of Vodin where he was listed as missing in action. During the planet's orbital space engagement with the Covenant, he fell from the planet's skyhooks into Vodin's atmosphere and plunged to the surface, only to survive the impact by landing in an ocean on the planet. He was rescued days later by local survivors and lived with them following the battle. Stranded and isolated from UNSC contact, Randall lived with the survivors for a full decade and was married to one of the colonists. When contact with the UNSC was established, Randall, now going by the name Aiken, maintained a low profile and preferred to stay with his wife and strong societal ties on Vodin than returning to service with the UNSC. In 2545, Aiken and his wife had a daughter named Natalie. Unfortunately, Aiken's wife died during childbirth. In 2546, ONI managed to locate Randall and made plans to reintegrate him into service, as they viewed him as a huge investment of the SPARTAN-II program. When Aiken refused, ONI deemed him compromised and no longer viable as a Spartan and so made plans to "decommission" him. Aiken forcefully—and successfully—refused this effort, but eventually negotiated a deal in which ONI "reversed" many of his Spartan augmentations through an excruciating process in return for his release from service to the UNSC. This compromise was personally approved by CINCONI, Admiral Margaret Parangosky. After concluding his dealings with ONI, Aiken and his daughter left Vodin and headed to the Outer Colony of Sedra where he enrolled as part of the Colonial Guard. Thanks in large part to his extensive training and history, by 2556 he advanced to leader of the local wing of the Guard as a Colonel. Aiken and Locke interrogating Axl. "You underestimate Sedrans, Commander. When we get punched in the mouth, we don't just outsource our fight to other people." On February 7, 2556, the City of Sedra was attacked by a Sangheili terrorist with a biological weapon. Many of the civilians infected by the bioweapon were brought to the Sedra Colonial Guard Hospital, including Aiken's own daughter. Jordan Gaines and Mason Hundley, two Office of Naval Intelligence operatives also affected by the weapon, were initially denied treatment by Aiken, due to his dislike of ONI. However, Lieutenant Commander Jameson Locke eventually convinced Aiken to allow their injuries to be treated. After discovering a Bactrian-class freighter used by the terrorist smuggle the weapon to the planet, Aiken agreed to work with Locke and his unit to track down the source of the element. Aiken violently interrogated the captured Yonhet supplier of the terrorist, named Axl, about the identity of the tug's pilots. However, Locke was able to communicate with the alien and persuaded Axl to reveal what information he knew. It was soon discovered that the element used in the bioweapon was from a partially functioning section of Installation 04, which had attempted an emergency slipspace jump during its destruction years earlier. Locke and his unit planned to destroy the source of the element with a HAVOK tactical nuclear weapon to prevent it from being used against humanity. After Aiken's daughter died of the infection, he and a Sedran Colonial Guard team joined Locke's ONI unit and left together for the Halo shard on a D81-LRT Condor dropship. "I don't wanna hear any more proper nouns until we exfil. No more Sedrans, no ONI. Just a team of soldiers." — Aiken taking command of the team. The team on the Alpha Shard. While traveling through slipspace in the Condor, the crew of the Condor began to argue. Aiken settled the argument by taking tactical command of the mission, and ordering the rest of the group to act like a team. Shortly after, the crew arrived at their destination and landed on the Halo shard's surface. After discovering the abandoned tug used by the smugglers, horse tracks were found nearby. The group followed the tracks' direction and come across the two smugglers—Arris Le and Haisal Wari—mining the element in a cave. The smugglers attempted to escape but Michael Horrigan and Locke quickly incapacitated and restrained the smugglers. The team began to return to the Condor for extraction; however, while the dropship was setting down, a large number of Lekgolo appeared and began to swarm over the Condor and it flew off erratically—now controlled by the Lekgolo. More Lekgolo eels appeared in large gestalt formations, forcing the group to retreat as three of the Sedrans and the horses were killed. The fast Lekgolo began to pursue the team who escaped into a narrow crevice. Locke used a special appliance to holographically camouflage their position from the aliens. However, the Lekgolo quickly sensed the cloaking unit and destroyed it. As the eels closed in on the group, Arris revealed that the Lekgolo can sense active technology and movement, prompting the group to reluctantly shut down the electronics present in their equipment. Unable to detect the humans, most of the Lekgolo left the area and the nine survivors moved out of the crevice. While the nine remaining members of the team continued their trek across the surface, it became apparent that only two members of the group would be able to escape in the smugglers' two-seat tug. Aiken concluded that the team must work together until the mission is complete, whereupon they would draw straws to decide which two individuals will make it. As the team continued to move towards the HAVOK warhead from the wreckage of the Condor, they abandoned their armor to prevent the Lekgolo from detecting them. The team only kept their oxygen packs that allowed them to breathe on the shard's thin atmosphere. While activating the packs to refill on oxygen, the group was discovered by the Lekgolo, resulting in Samantha Wisner's death. The survivors were ultimately able to escape the worms. Later, when taking another oxygen break, Horrigan and Gregory Ramos betrayed the remaining survivors, and took the weapons and oxygen packs for themselves. The two also took Arris, as they needed him to activate the freighter. While the traitors abandoned the team, Aiken discovered the crashed Condor. Randall preparing to manually detonate the HAVOK warhead. Jameson Locke: "See you in Valhalla." Randall Aiken: "They don't let ONI into Valhalla... but you they might." As Aiken, Locke, and Private Talitha Macer approached the Condor, they realized that it was functional enough to transport them to the tug. Aiken ordered for both of them to take the dropship to the tug and escape, while he remained behind and activated the nuke. However, Locke and Macer both refused and, instead, the group decided to "draw straws" to choose who remains behind, explaining how the sailors of the Great British Royal Navy had done so in the 18th century. Aiken broke apart his daughter's necklace and used its beads as straws; the one who would draw a red bead from his enclosed hand would stay behind. Locke and Macer both drew white beads, and reluctantly agreed to allow Aiken to stay behind and activate the nuke. However, in truth, there was no red beads in Aiken's hand as he wanted both of them to survive. After exchanging parting words with Aiken, Locke and Macer left in the Condor to make it to the tug. Once they arrived at the tug, Lekgolo worms attacked and killed Ramos and Horrigan, after Arris was gunned down by the latter. Locke and Macer were only able to escape from the worms when Aiken activated the HAVOK and, inadvertently, drew the Lekgolo towards himself. Randall ultimately sacrificed himself to detonate the HAVOK warhead, destroying the source of the bioweapon, while Lieutenant Commander Locke and Private Macer escaped Alpha Shard. Randall was known for his remarkable history and had a deep-rooted mistrust for the Office of Naval Intelligence. During his SPARTAN-II training, Randall showed a particular proficiency for combat leadership. However, he was also less sociable than his Spartan compatriots off the field. Randall shows a belief in the Norse afterlife of Valhalla and believes that ONI agents, due to their nature would not be allowed there. Despite his distrust of ONI, Randall grows to like and trust Commander Jameson Locke and shows a belief that Locke's nature would allow him into Valhalla. After his daughter's death, Randall appears to have become somewhat suicidal with nothing to live for but preventing the bioweapon from being used against his people again. He purposefully tricks Locke and Private Talitha Macer so that he will be the one performing the suicide mission of destroying the deposits with the nuclear weapon while sparing both of their lives. 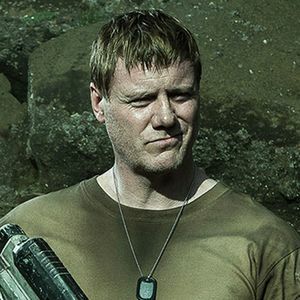 Randall Aiken is portrayed in Halo: Nightfall by English actor Steven Waddington. Randall's Spartan tag was originally inferred by fans from the "KMA 037R" license plate Easter egg in Halo 3: ODST ("(K) Missing in Action, 037, Randall"). Most of the license plates coincide with the initial and tag of a canonical Spartan, and as such, they are regarded as a reliable source of information. Randall's and Rosenda-A344's service tags, both of which were derived from the license plates, were later officially canonized by 343 Industries. Though the identification patch on his uniform gives Aiken's blood type as O+, a file on Jameson Locke's data pad lists it as AB-. Though this is likely a production oversight, it is possible that Aiken's blood type was changed when ONI curtailed his augmentations, a phenomenon that sometimes occurs after bone marrow transplants. Aiken with Agent Locke, Macer, and Wisner in Halo: Nightfall. Randall's career service viewed by Agent Locke and Macer. Randall Aiken (far left) during the Mission to Alpha Shard in Halo Mythos. ↑ Halo: Evolutions - Essential Tales of the Halo Universe, "Pariah"